Well....if you are looking for something unique for the golfer, who is retired or not, then look no further. We have listed 2 new embroidered golf towels in our Etsy shop. 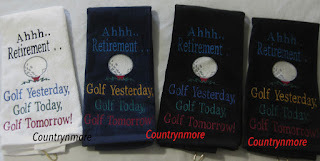 We now have the Ahhh Retirement Golf Towel in Navy Blue and Black. We don't have towels on hand, but this is the second towel set that was ordered by a fellow business group member. 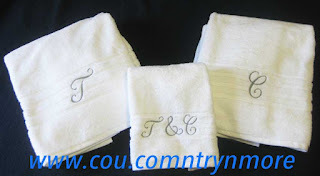 I really like the softness and the beauty of these towels. The first set of towels was for him and his girlfriend. The letter style was block as seen here. This time, they couldn't choose between block letters or cursive font. After sending them images of the stitched out font from our software program, they decided on Sharadee font. The initials T and C, look fabulous stitched out in gray. When I dropped these towels to the customer's mother, she was very impressed. Little did she know that our business group decided to give her, her own set. 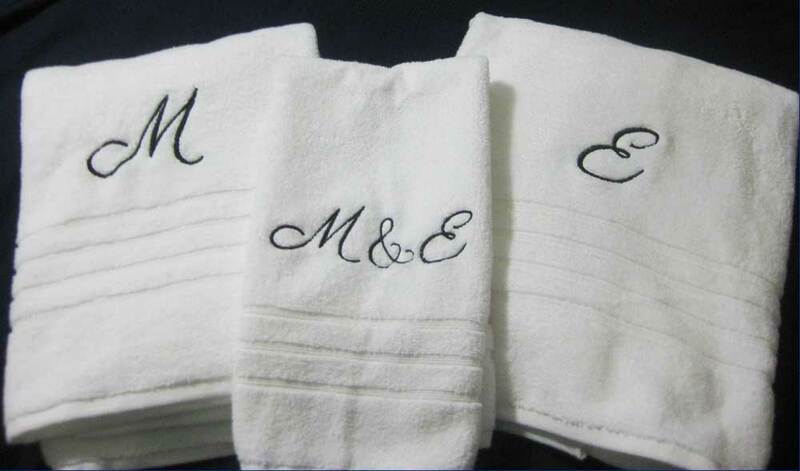 You see, Marsha recently got married and we wanted to give her a set. She told me after opening up her gift, that when she saw the towels pictured above, that she wanted a set for her new home.